Camden Catholic HS at Cherry Hill East HS Boys Basketball Game. Camden Catholic HS #25 Babatunde Ajiki is trying to keep a ball from Cherry Hill East #33 Zach Frye at 3rd Period Dec.18 2018 AKIRA SUWA / For The Inquirer. 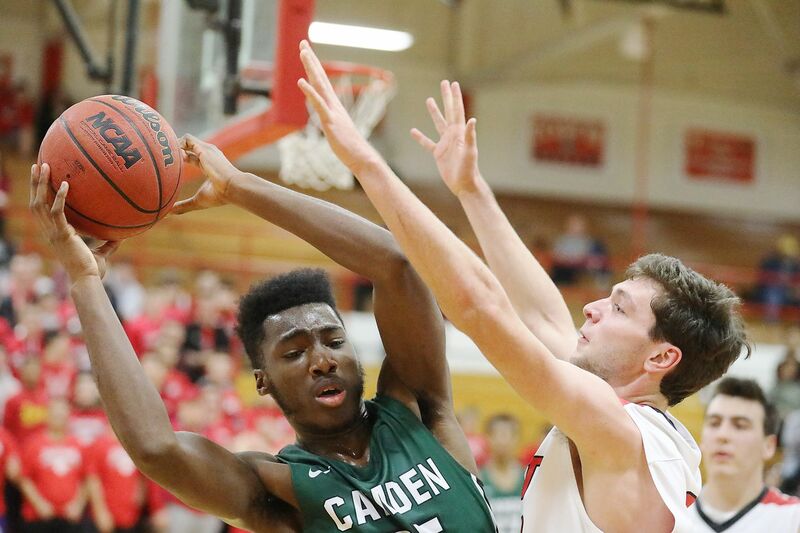 Babatunde Ajike scored 17 points as the Camden Catholic boys' basketball team edged Timber Creek, 51-45, on Tuesday. Zach Hicks recorded 15 points. Jerome Brewer’s 20 points led Camden past Eastern, 49-42. Ethan Tarte added 11 points. Doane Academy lost to New Foundations, 54-44. Shawn Congelton scored 16 points for the Spartans. Khalif Battle scored 17 points in Trenton Catholic’s 58-53 win against Westampton Tech. Donavin Crawford notched 10 points. Jaelin Keels scored 21 points as Kingsway beat Hammonton, 62-48. Anthony DiCaro scored 17 points to lead Cherokee past Shawnee, 55-26. Gavin Gibson added 12 points. Ahmad Gantt scored 16 points to help Cinnaminson down Pemberton, 77-37. Zach Artur and Chad Howard scored 10 points apiece. Wisler Sanon scored 19 points and Hartnel Haye added 18 as Paul VI topped Seneca, 92-55. Jaden Arline scored 17 points, and Andrew Harrell and Tyshon Judge each added 14 points. Jamere Muschette’s 21 points guided Cumberland to a 59-49 victory over Gloucester Catholic. Antonio Gil tallied 16 points. Florence lost to Foundation Collegiate Academy, 42-34. Shaharia Shajib scored 13 points for the Flashes. Christian Burnett and Jordan Martin scored 19 points apiece in Bordentown’s 68-66 win against Rancocas Valley. Roshon Vankline added 14 points. Burlington Township topped Medford Tech, 64-43, behind Emmanuel Ayetigbo’s 27 points. Wesley Robinson notched 14 points. Dan Fleming netted 26 points and Dylan Heine scored 16 as Haddonfield rolled past Sterling, 85-43. Aiden Blake added 14 points and Andrew Gostovich tallied 10. Jordan Lipford scored 24 points in Cherry Hill West’s 63-52 overtime victory over Northern Burlington. Amir Smith notched 11 points. Ian Farrell and Alex Stockton scored 17 points apiece to lead Riverside past Maple Shade, 59-57. Danny Devlin scored 13 points. Steve Matlack drained five three-pointers to record 17 points as Lenape defeated Bishop Eustace, 54-36. Anthony Cortese added 16 points. Woodbury downed Holy Cross, 56-35, behind JayShawn Harvey’s 18 points. Tommy Carter scored 14 points and Javon Solomon recorded 13. Javon Gordon scored 22 points in Delsea’s 71-54 victory over Triton. Kobey Evans notched 21 points. Maddie McCracken scored 24 points as Wildwood defeated Salem, 63-42. Imene Fathi tallied 14 points. Nay Nay Clark scored 14 points in Oakcrest’s 43-36 victory over Buena. Ionyonia Alves added 11 points. Northern Burlington topped Cherry Hill West, 55-33, behind Brianna Sorrento’s 17 points. Alexa Blue scored 10 points. Moorestown Friends fell to Abington Friends, 52-36. Veyoni Davis scored 21 points for the Foxes. Melisa Hawkins recorded nine points, eight rebounds, three steals and one assist as Palmyra beat New Egypt, 27-17. Ashanti Taylor notched nine points, eight steals, four rebounds and two assists. Highland edged Deptfrod, 45-41, thanks to Katie Morrison’s 13 points. Janazhia Clinton scored eight points and Tamarah Lowber added seven. Olivia Smith scored 22 points to lead Florence past Medford Tech, 39-18. Hailey Russell scored 16 points and Riley Starke added 12 in Riverside’s 37-26 victory over Maple Shade. Burlington City defeated Delran, 39-31, as Dominique Barnes scored 15 points. Chloe Bennett’s 25 points led Gloucester to a 41-31 win against Woodstown. Gina Rucci scored 11 points to help Clearview edge Williamstown, 36-34. Bella Steidle added eight points. Hannah Cooksey scored 19 points and Caroline Zullo tallied 14 in Pennsville’s 51-41 victory over Schalick. Deji Cook scored 11 points as Glassboro beat Penns Grove, 44-31. Trinee Gadson notched nine points. Kamille Morton’s 21 points lifted Delsea past Triton, 53-43. Peyton Gilmore scored 16 points.